Front row, from left, Drew Hausler, ACE mentor, DHW Architects; Travis Ruff, senior, Chattanooga State Polytechnic Academy; Molley Petty, junior, Grace Academy; Jenna Voils, junior, Soddy Daisy High School; Esme Williams, senior, Chattanooga High School Center for Creative Arts; Caitlin Moffitt, ACE Southeast Tennessee and North Georgia Board of Directors, Barge Design Solutions; Ben Nemec, ACE mentor, Barge Design Solutions; Bo Turner, DHW Architects. Back row, from left, Jim Williamson, ACE Southeast Tennessee and North Georgia Board of Directors, River City Company; Thomas Breazeale, sophomore, McCallie School; Thomas Edwards, senior, McCallie School; Hudson Quatro, senior, McCallie School; Jace Holt, junior, McCallie School; Christian Geralds, senior, McCallie School; Steven Sabacky, ACE mentor, March Adams; and Tyler Gross, ACE mentor, Barge Design Solutions. Barge Design Solutions, Inc., has made a $3,000 donation through its Community Fund to ACE Mentor Program of Southeast Tennessee and North Georgia to help fund college scholarships. The ACE (Architecture, Construction, and Engineering) Mentor Program engages, inspires, and enlightens high school students to pursue careers in design and construction industries by pairing local high school students with ACE professionals. Students meet weekly with a mentor to learn about design and construction career opportunities and work on real-world projects. 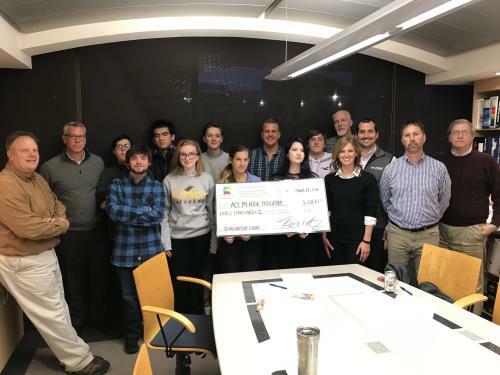 Barge Design Solutions’ contribution will help provide a $3,000 scholarship to a student pursuing an ACE-related field of study post-graduation. Caitlin Moffitt, a Barge Design Solutions employee and former ACE student, currently serves on Southeast Tennessee and North Georgia Chapter’s Board of Directors and as a civil engineer mentor. Tyler Gross and Ben Nemec, of Barge Design Solutions volunteer as civil engineer mentors.